This oval yoga mat is slip-resistant, environmentally friendly, and provides a cushioned, yet flexible surface from which you can work to bring your practice further than ever before. Shape: Earth-loving oval shape features straight sides and rounded corners that won’t curl. 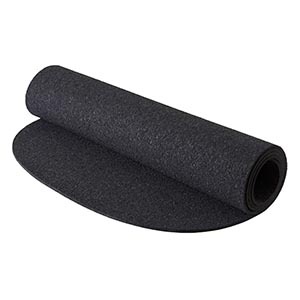 Thickness: 3/16” of dense cushion keeps joints safe without sacrificing connection to the earth through balancing poses. 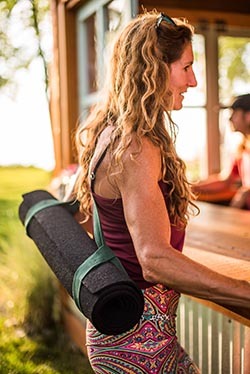 Size: 72” x 24” of sacred space, longer than an average mat, and lighter at 3.7 lbs, it fits into your standard yoga mat bag or sling. Material: 100% recycled rubber, but without the “new car smell” of other rubber mats. Performs on all surfaces including wood, grass, sand and cement. PVC & Toxin Free. The Kiss The Sky mat will remain firmly in place on all types of surfaces and will protect against instances of slipping, even when things begin to get sweaty, hot, and intense. Find out more about the Oval Yoga Mat here. Enter every day November 26th – 30th to increase your chances to win! Kiss The Sky is committed to creating yoga products that evoke a lifestyle so you can free your mind, inspire your body, and ease the environmental burden that we continuously place on our planet. Learn more about Kiss The Sky Yoga products and their organization on their website. *Winner will be notified by email within 3 days after sweepstakes completion. You must provide a valid mailing address and reply within 7 days to obtain your prize. My Area Yoga is an online directory, calendar, blog, and information hub for the wellness and yoga community. Currently offering service in the northeast, as well as Chicago. Our mission is to be the most comprehensive online resource for the local communities. Win Two Tickets to Shakti Fest! Get Your Downdog On!Join our mailing list and you'll receive regular updates and special news about yoga and wellness in your area. Make sure you’re the first to know about local yoga happenings, giveaways and more!